From the Annals of the War Presidents – In 1966, U.S. President Lyndon B. Johnson met with South Vietnamese Premier Nguyen Cao Ky in Honolulu. At the time, American involvement in the Vietnam War was already spiraling out of control and the motivation for the talks may have been to address growing public opinion against the war. 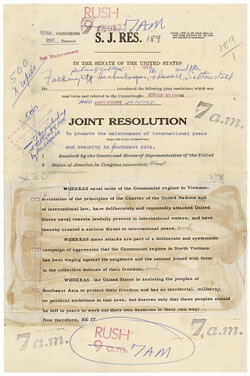 The talks resulted in the issuance of a joint declaration in which the United States promised to help South Vietnam “prevent aggression” and establish “the principles of self-determination of peoples and government by the consent of the governed.” As part of his public relations campaign for continuing the war, Johnson declared: “We are determined to win not only military victory but victory over hunger, disease, and despair.” Johnson referred to this as “The Other War” meaning the supposed effort to improve the lives of the South Vietnamese through increased security, and economic and social programs to win the so-called “hearts and minds.” Red does not need to point out the utter failure of all of this. This entry was posted in Today in Texas History, Uncategorized and tagged Hearts and Minds, LBJ, Lyndon B. Johnson, Nguyen Cao Ky, South Vietnam, Vietnam War on February 6, 2019 by Red from Texas. From the Annals of the U.S. Wars of Choice – In 1965, President Lyndon B. Johnson sent a Marine Corps Hawk air defense missile battalion to Da Nang, South Vietnam. The troops were deployed to provide protection for the key U.S. airbase there. This was the first deployment of U.S. combat troops to South Vietnam. The move provoked strong reactions to an apparent new level of involvement in the Vietnamese conflict. Communist China and the Soviet Union threatened to intervene if the U.S. continued military support of the South Vietnamese regime. The U.S. Embassy in Moscow was attacked by demonstrators (including Vietnamese and Chinese students) in a move orchestrated by the Kremlin. Britain and Australia supported the U.S. action, but France called for negotiations. LBJ had little appreciation of the horrors of war as he had avoided any real combat action in WWII and he was known throughout his life as being an intense physical coward. He showed no hesitation in sending others off to die in his foolish war. The escalation of U.S. involvement in what had been essentially a civil war was now official and the mistaken judgment of LBJ in blundering into the Vietnam War would not end until more than 58,000 U.S. servicemen and women had lost their lives in the futile struggle. This entry was posted in Today in Texas History, Uncategorized and tagged Da Nang, LBJ, Lyndon B. Johnson, Marine Corps, South Vietnam, Vietnam War on February 9, 2018 by Red from Texas. From the Annals of the Undeclared Wars – In 1964, Pres. Lyndon B. Johnson first began to come under pressure for his plan to escalate the undeclared war in Vietnam. Senator Gaylord Nelson (D-Wisconsin) began to speak out against preparation for additional troops in Vietnam. Nelson claimed that Congress did not intend the Gulf of Tonkin Resolution to endorse escalation into a full scale war in Vietnam. The GOTR had been passed on August 7 in response to North Vietnamese patrol boats allegedly firing on U.S. warships in the waters off North Vietnam on August 2 and 4. Whether there was an attack and if so, whether it was provoked has been much debated, but the incident prompted Congress to pass the GOTR with only two dissenting votes in the Senate. The GOTR gave Johnson power to “take all necessary measures to repel an armed attack against the forces of the United States and to prevent further aggression.” Johnson apparently viewed the resolution as giving him a free hand and began a major escalation of the conflict which ultimately cost the U.S. 58,220 lives and achieved nothing. This entry was posted in Today in Texas History, Uncategorized and tagged Gaylord Nelson, Gulf of Tonkin Resolution, LBJ, Lyndon B. Johnson, Texas History, Vietnam War on October 5, 2017 by Red from Texas. From the Annals of Warmongering – In 1965, President Lyndon B. Johnson sent a Marine Corps Hawk air defense missile battalion to Da Nang, South Vietnam. The troops were deployed to provide protection for the key U.S. airbase there. This was the first deployment of U.S. combat troops to South Vietnam. The move provoked strong reactions to an apparent new level of involvement in the Vietnamese conflict. Communist China and the Soviet Union threatened to intervene if the U.S. continued military support of the South Vietnamese regime. The U.S. Embassy in Moscow was attacked by demonstrators (including Vietnamese and Chinese students) in a move orchestrated by the Kremlin. Britain and Australia supported the U.S. action, but France called for negotiations. But the escalation of U.S. involvement in what was essentially a civil war had begun and would not end until more than 58,000 U.S. servicemen and women had lost their lives in the futile struggle. This entry was posted in Today in Texas History and tagged DaNang, LBJ, Lyndon B. Johnson, U.S. Marine Corps, Vietnam War on February 9, 2017 by Red from Texas. From the Annals of LBJ – In 1965, President Lyndon B. Johnson deployed a Marine Corps Hawk air defense missile battalion to Da Nang. LBJ sent the troops to provide protection for a U.S. airbase. This was the first commitment of American combat troops in South Vietnam and there was considerable reaction around the world to the new stage of U.S. involvement in the war. Red China and the Soviet Union threatened to intervene if the U.S. became further involved in propping up the South Vietnamese regime. In Moscow, some 2,000 demonstrators, led by Vietnamese and Chinese students, attacked the U.S. Embassy. Britain and Australia supported the U.S. action, but France called for negotiations. This entry was posted in Today in Texas History and tagged Da Nang, LBJ, Lyndon B. Johnson, Marine Corps, Texas History, Vietnam War on February 9, 2016 by Red from Texas. From the Annals of the Presidency – In 1973, former President Lyndon Baines Johnson passed away in Johnson City at the age of 64. 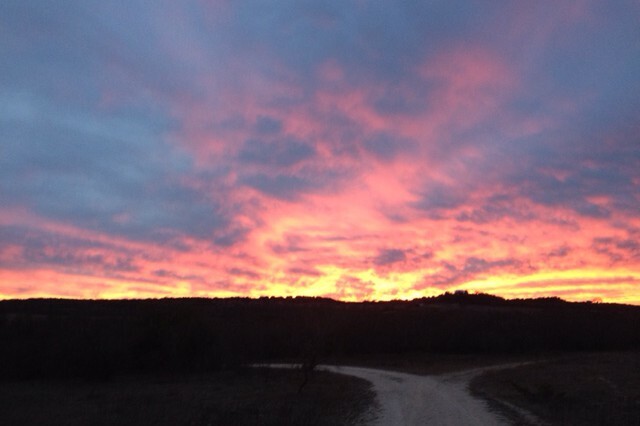 After deciding to not stand for re-election, LBJ went back his ranch in Central Texas. According to many, LBJ worked as hard at ranching as he had as a politician. The presidential biographer, Doris Kearns, observed Johnson working on the ranch with the same level of intensity he had tackled work in the Oval Office. Each morning, Johnson would instruct his ranch hands to make a “solemn pledge that you will not go to bed tonight until you are sure that every steer has everything he needs. We’ve got a chance of producing some of the finest beef in this country if we work at it. And if we treat those hens with loving care we should be able to produce the finest eggs in the country.” He ordered daily reports on the production of eggs. To Kearns, Johnson’s frustration with his hens’ egg production echoed the frustration he experienced in failing to conclude an un-winnable war in Vietnam. The ranch work could not conceal the fact that LBJ was, in his own words, miserable. His legacy of accomplishment as the creator of a “Great Society” and in passing the landmark Civil Rights Act of 1964 was being overshadowed by the floundering war in Vietnam and the anti-war movement. On the day of Richard M. Nixon’s inauguration, Johnson watched sullenly as Nixon announced the dismantling of many of Johnson’s Great Society social programs. The next day, Nixon announced that he had achieved the ceasefire in Vietnam that had eluded Johnson. Johnson had reportedly predicted that he would die if his vision of the Great Society died. The following day, while Lady Bird and their daughters were in Austin, Johnson suffered a fatal heart attack. He is buried in a family cemetery at the ranch. One can only imagine what he would think about the likes of Trump and Cruz. This entry was posted in Today in Texas History and tagged Great Society, Johnson City, LBJ, LBJ Ranch, Lyndon B. Johnson, Richard M. Nixon, Texas History, Texas Politics, Vietnam War on January 22, 2016 by Red from Texas. From the Annals of Heroism – In 1968, Staff Sgt. Marvin Young was killed in action near Ben Cui, Vietnam. Young was a native of Alpine who enlisted in the army in 1966. He was leading a patrol of Company C, Fifth Infantry, Twenty-fifth Infantry Division when they were attacked by a large force of North Vietnamese. When the squad leader was killed, Young assumed command and repeatedly exposed himself to enemy fire, while encouraging his men. He ignored orders to pull back and remained behind to assist several of his men who were unable to withdraw. Even after being wounded, he refused assistance and stayed to cover the withdrawal of other troops. He was posthumously awarded the Congressional Medal of Honor. This entry was posted in Today in Texas History and tagged Congressional Medal of Honor, Marvin Young, Texas History, Vietnam War on August 21, 2015 by Red from Texas.